If I could only say one thing to people who read my blog, it’s that dinner doesn’t have to be complicated. 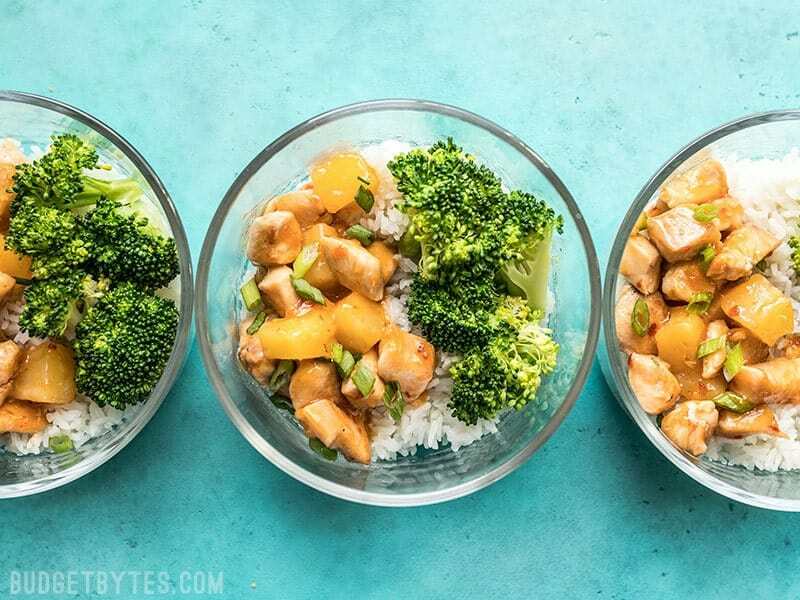 These Sweet Chili Chicken Stir Fry Bowls are the perfect example. It’s really more of a “formula” than a recipe. 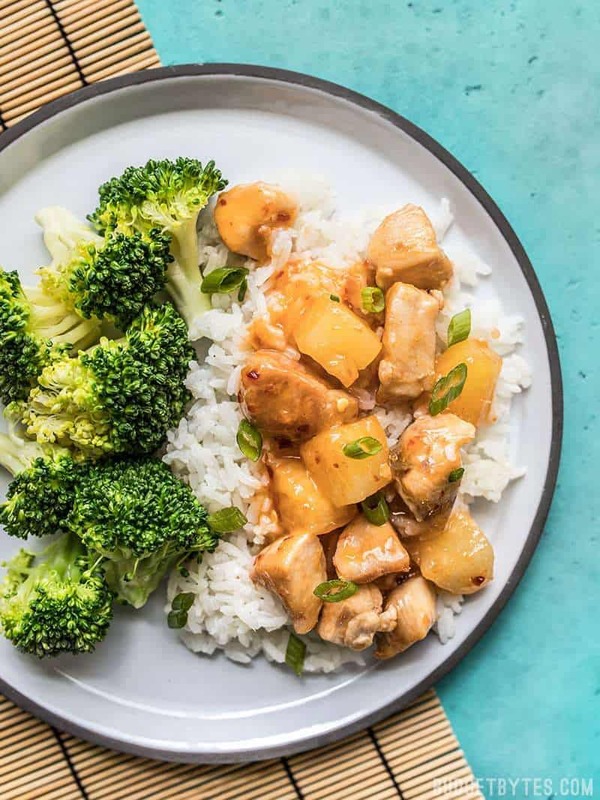 Just stir fry a protein (even if it’s not chicken), add a sauce (either homemade or bottled), spoon it over rice or another starch, and add a simple steamed vegetable. Done and DONE. Scroll down for some ways to switch up this “formula” to make several different varieties of this incredibly easy weeknight dinner. The Pyrex glass bowls pictured above can be found in my Amazon shop. Proteins: shrimp, tofu, tempeh, ground meat (beef, pork, chicken, or turkey). Sweet Chili Chicken Stir Fry Bowls use my favorite "formula" for keeping weeknight dinners simple and effortless. Customize the formula to make your own! Begin the coconut rice first. 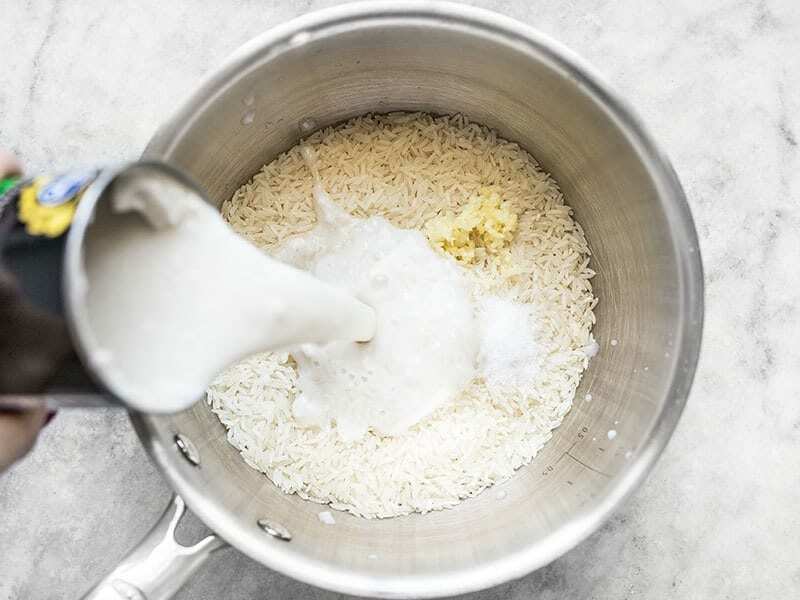 Add the jasmine rice, garlic, salt, coconut milk, and water to a sauce pot, then give it all a brief stir. Place a lid on the pot and bring it up to a boil over high heat. As soon as it reaches a full boil, turn the heat down to low and let it simmer for 15 minutes. After simmering for 15 minutes, turn the heat off and let it sit undisturbed, with the lid in place, for 5 minutes. 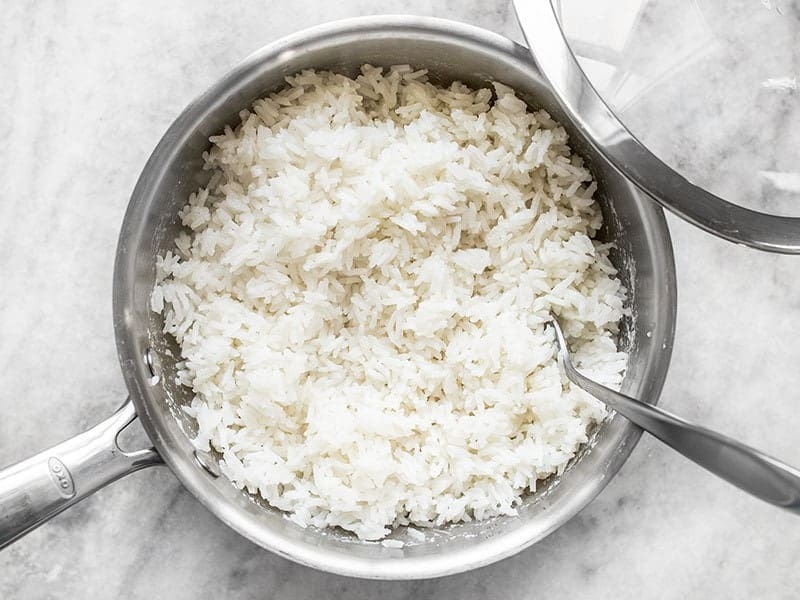 Fluff the rice, and set it aside until ready to serve. While the rice is cooking, prepare the steamed broccoli. Cut the broccoli crown into florets. Add one inch of water to a large pot, place a steaming basket in the pot, then place the broccoli crowns in the basket. Place a lid on the pot, then place it over medium high heat. Allow the water to come up to a boil, and steam the broccoli until it is bright green and tender (about 5 minutes). Remove the broccoli from the heat and set aside until ready to serve. 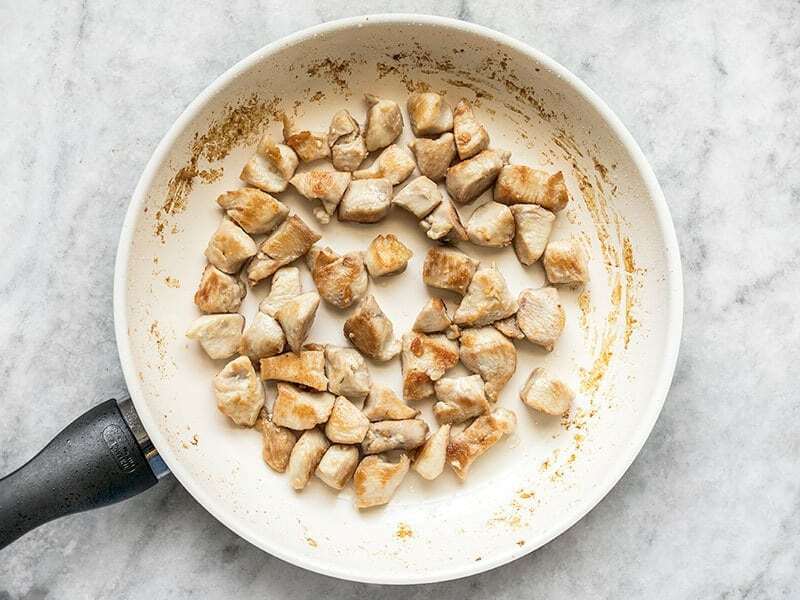 While the rice and broccoli are cooking, prepare the chicken stir fry. Dice the chicken into 1-inch pieces. Season with a pinch of salt. Heat 1 Tbsp cooking oil in a large skillet over medium-high heat. Once hot, add the chicken and stir and cook until the chicken is cooked through and slightly browned on the outside. 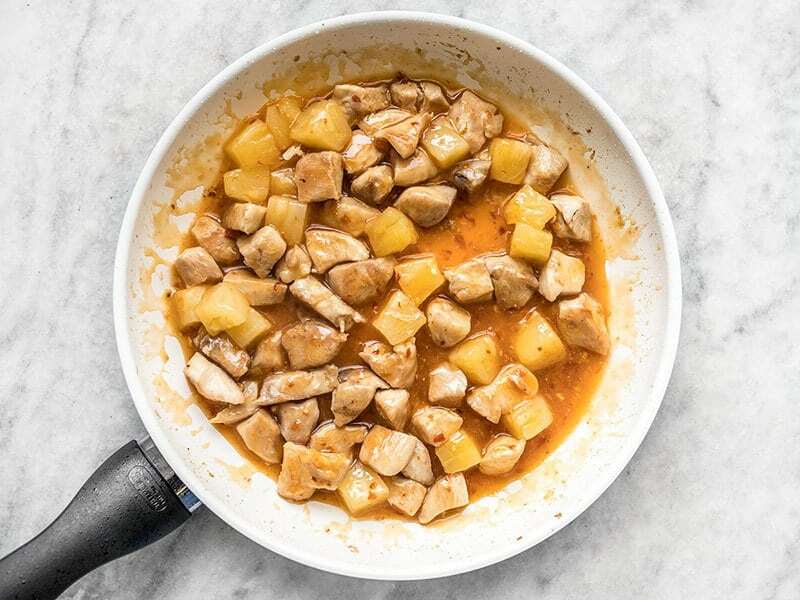 Drain the can of pineapple, then add the pineapple to the skillet along with the sweet chili sauce. 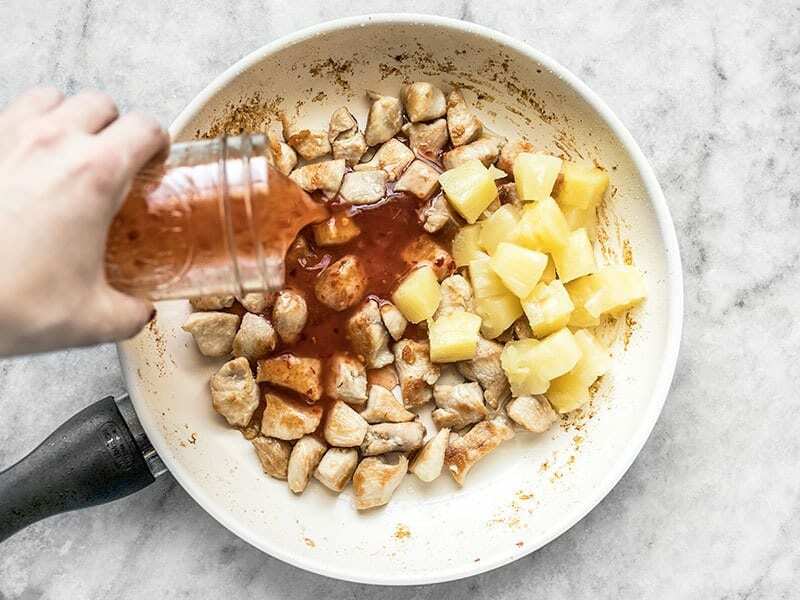 Stir and heat the sauce and pineapple through (about 2 minutes). To serve, place about 1 cup rice in each bowl, add 1/4 of the sweet chili chicken mixture, and 1/3 of the broccoli. Enjoy immediately, or refrigerate until ready to serve. Lasts about 4 days in the refrigerator. *Use homemade sweet chili sauce or store bought for convenience. **Frozen broccoli florets can be used in place of fresh. Begin the coconut rice first, since it takes the longest to cook and is mostly hands-off, so you can cook the rest of the items as the rice does its thing. Add 1.5 cups jasmine rice to a sauce pot along with one clove of minced garlic, 3/4 tsp salt, 1 15oz. can coconut milk, and 1 cup water. Give it a brief stir, then place a lid on top, and bring it up to a boil over high heat. As soon as it reaches a full boil, turn the heat down to low and let it simmer for 15 minutes. After simmering on low for 15 minutes, turn the heat off and let the rice rest undisturbed, with the lid in place, for 5 minutes. Then fluff the rice with a fork and set the rice aside until you’re ready to serve. Once the rice is on the stove, begin the broccoli. Chop one crown of broccoli (about 1 lb.) into florets. Add about one inch of water to the bottom of a pot, place a steaming basket in the pot, then add the broccoli florets to the basket. Place a lid on the pot and bring it up to a boil over medium-high heat. 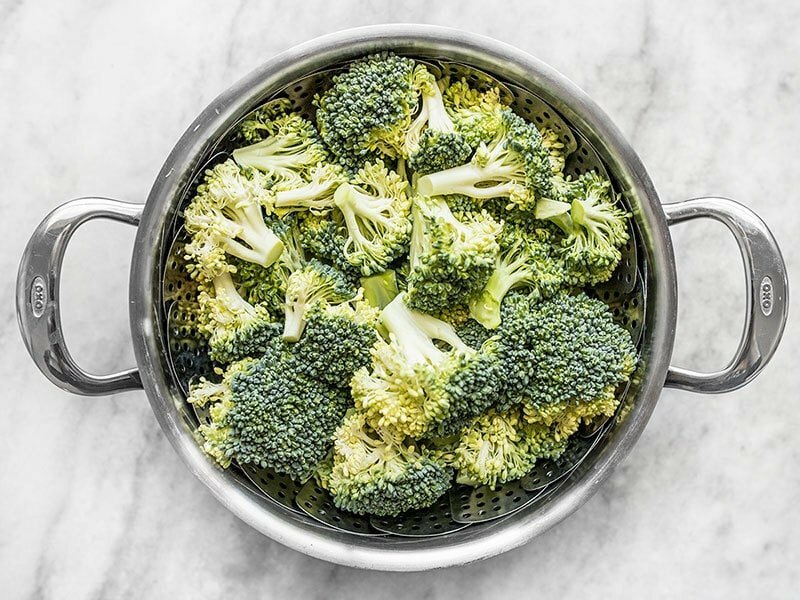 Once boiling, allow the broccoli to steam until bright green and tender (about 5 minutes). After cooking, turn off the heat and set the broccoli aside until ready to serve. And lastly, begin the chicken. 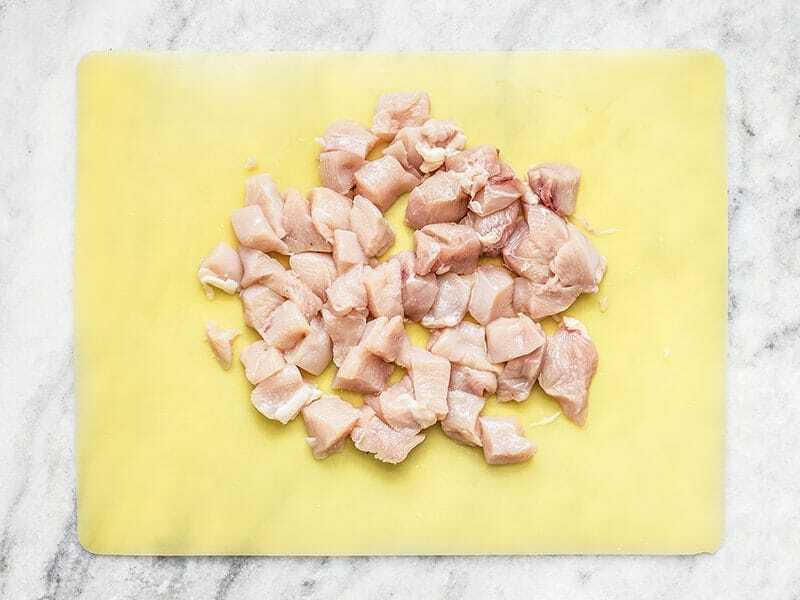 Dice two chicken boneless, skinless chicken breasts (about 1.3 lbs. total) into one-inch pieces. Season with a pinch of salt. Heat one tablespoon cooking oil in a large skillet over medium-high heat. Once hot, add the diced chicken and stir and cook until the chicken is cooked through and slightly browned. Once the chicken is cooked through, add one 8 oz. can of pineapple tidbits (drained of the juice) and 1 cup sweet chili sauce (store bought or homemade). Stir and heat through. This should only take a minute or two. 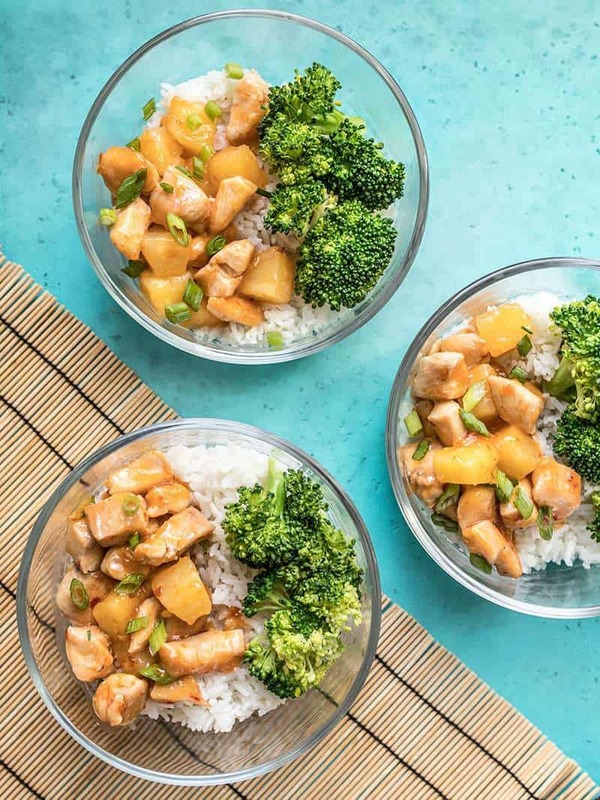 To build the bowls, add about 1 cup coconut rice to each bowl and top with 1/4 of the sweet chili chicken stir fry mixture, and 1/4 of the broccoli. You can serve this immediately, or refrigerate it for your meal prep for the week! Easy and delicious, and a perfect meal prep! I loved this recipe, and it’s a good alternative to one of my all-time favorite recipes of yours, the Mango Coconut Tofu Bowls. I know I’ll be making this again over the spring/summer! Is it safe to reheat this rice? Yes. The danger with reheating rice actually arises with how fast the cooked rice is cooled down after cooking. If it takes too long for the rice to cool, bacteria has the opportunity to begin to grow and multiply, and then the reheated rice will pose a food safety threat. Since these bowls are in small, single portions, it will cool very quickly if transferred to the refrigerator immediately after cooking and the leftovers will be safe to reheat for 3-4 days. This is our favorite recipe from budget bytes! We buy a big bottle of sweet chili sauce and make it every other week with broccoli and bell pepper. My husband is still learning to cook and he pulls this one off on his own without a problem. 10/10 recommend!! This looks great! Do you have any recommendations to replace the pineapple? I’m allergic. Mango would probably be great! as a single person, are these freezeable? These will not be the best for freezing since they use a cornstarch thickened sauce. Cornstarch sauces tend to separate upon freezing and thawing. But they will stay good in the fridge for about 4-5 days! Hey I know this might be a lot to ask but can you put the macros (protein, fat, carbs) for each meal? I love your recipes!! I’m sorry, I don’t have a reliable source for that information. Can you cook the rice in the instant pot with the coconut milk? I haven’t tried it, but I would guess it would work. I’ve tried this multiple times and find that the IP NEVER can pressurize. If I were to try again I would use a manual setting rather than the rice setting. Your formula is fantastic! But I’m surprised your sauces list was so same-y; what about tomato sauces or salsa, a creamy mushroom sauce, cheese sauce, salad dressings, or even pesto?